Having a real busy week at Stripper's Guide world headquarters, only had time to prep one item for Herriman Saturday. This sports cartoon was originally published October 5 1906. A larger selection next week, promise! The Portland Beavers won the 1906 Pacific Coast League pennant. 1906 was the first year the team used the name Beavers. Thanks for the Herriman. BTW, today I took the family to San Francisco's Cartoon Art Museum. There was a nice selection of newspaper comics, including two Herrimans, and a room full of Peanuts. The lead exhibit was "Why Do They Hate Us", a selection of editorial cartoons from around the world. Stripper's Guide Bookshelf: By George! Herriman fans have been waiting years for a series like this to be published, and we always knew that pioneering comics scholar and katophile Bill Blackbeard would have to be at the helm. Blackbeard is most likely the only person in the world with a complete run of these rare strips at his disposal. His bound volume runs of many of the Hearst papers puts him in the unique position of not only having unparalleled access to Herriman's productions from the late 1900s and 1910s, he can even cross-reference between various Hearst papers to find strips that might not have seen print in all papers, and luxury of luxuries, even pick and choose the paper that has each strip printed in the best and most complete format. So far there are five volumes in the By George! series. The first volume includes runs of Mr. Proones the Plunger, a 1907 strip that ran only in the Los Angeles Examiner, followed by Baron Mooch and Gooseberry Sprig from 1909-10. 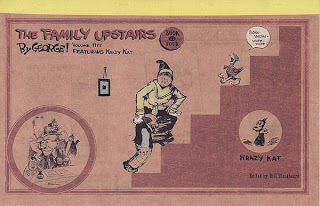 Volumes two through five are devoted to Herriman's first popular success as a strip cartoonist, The Family Upstairs (aka The Dingbat Family). It was here that a certain kat and mouse first began their love affair while gamboling in the lower portion of the strip. If you have a copy of the 1970s Hyperion reprint of the Family Upstairs you may think it unnecessary to purchase these new volumes. Nothing could be further from the truth. The tiny and unrestored reproductions in the Hyperion book are horrifyingly bad in comparison with the huge reproductions here, and here the strips have been lovingly and painstakingly restored. Some individual strips are still in less than perfect shape, due no doubt to source material that was beyond the restorer's art, but the vast majority are excellent. while reading, an annoyance that can only be overcome if you are willing to put a permanent crease in each page as you read. Blackbeard is an entertaining writer and his forewords to the first volumes are a delight to read. Volume 4, however, includes explanatory notes from volume 2, and volume 5 has no editorial matter whatsoever (I'm guessing that this has something to do with Blackbeard's failing health in the last few years). Book three is a special treat, with a fascinating article in which Blackbeard explains how he came to possess these wondrous bound volume runs. The article was originally printed in the International Journal of Comic Art, an extremely highbrow scholarly publication where I'm sure few of us saw it the first time around. Blackbeard has forgotten more about comic strip history than most of us will ever know, but in these forewords he makes a few pronouncements that are simply incorrect. The most egregious is his contention that Mr. Proones is Herriman's first daily strip -- not by a long shot Bill, especially if you're going to count Mr. Proones which was not a true daily. Minor quibbles aside, these books are like manna for the Herriman fan. Go order yours now at the publisher's website. These volumes are not available through other outlets as far as I know. Contest -- Get a Free Book! When I ordered my set of these books a series of SNAFUs resolved in the end with me having two copies of volume 5 of the series, one of which was gratis. So I think it only right that I pass it along to someone here on the blog, sort of as a promotion for the series. The book will go to the blog reader who can name the most Herriman daily series that precede the appearance of Mr. Proones. Features qualify if they ran in black and white in daily newspapers for more than one installment with a consistent title. One-shots don't qualify, Sunday strips do not qualify. 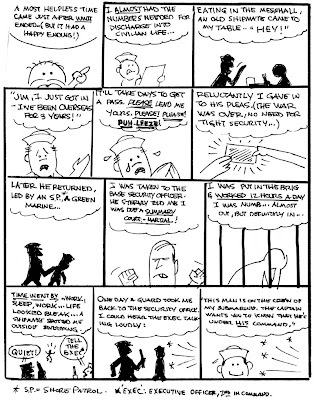 Daily strips do not have to have run as 'true' dailies, that is six days a week. You can post your answers on the blog or email them to me at stripper@rtsco.com (the latter may be preferable if you don't want to share info with other entrants). If you name a strip of which I'm unaware it doesn't qualify unless you can supply some proof of its existence. In the event of a tie the judge's ruling is final, yada yada yada. Contest ends next Friday. Winner will get the book free, shipping included, unless outside the U.S., in which case you'll have to pay the postage. Not to get off the subject, because I can't name any of Herriman's series, but do you know of anywhere that lists cartoonists books? I'm trying to find out how many books there are from strips like Hagar, BC, Andy Capp, etc. Tried Toonipedia and Daryl Cagle, but neither of them has anything like that. And if you find such a list, Mamafrog, make sure it lists the Australian reprints as well. I just bought ten yearly Wizard of Id books. They reprinted BC in that format as well - magazine size books with a carton cover. I also have quite a few British Hagar books with the sundays reprinted at a square pocket book size. Tony Strading of the UK has a gallery of such things on his site (yes, Ger, even some of the Australian ones); but I don't think it is anywhere near a complete list. For a list of U.S. mass market paperbacks you will have to join Ray Bottorff's ComicBacks Yahoo group. My Stripper's Guide index does include a list of reprint books for each feature, though I haven't listed foreign reprints for the most part. Thanks for the help guys--I think some of these will do the job. I'm trying to replace and fill out collections of my favorite artists and needed a list of books. I have found some on paperbackswap.com (a great site for book lovers in general). Everyone tends to keep or just throw away their old books and I have a hard time finding them! I surrender and humbly bow to Allan who must have discovered some obscure secrets concerning George Herriman’s productions. In fact – apart the 1906 “Amours of Marie Anne McGee” which every blogger should know (posting of Saturday, August 11 1907), the only other “Weekday strip” (this is how I call the series which were published in weekdays, but not all days) anticipating “Proones the Plunger” I succeeded in finding is “Home, Sweet Home”, published in 1904 in Frank A. Munsey’s “New York Daily News. For the short-lived Sunday section of that newspaper, Herriman created the Sunday series “Bud Smith” and “Major Ozone”, later continued for World Color Printing; possibly he did some other weekday strip I don’t know --- also if I have a very faint remembrance of a possible first avatar of “Us Husband”, a series that Herriman recreated (or probably simply “created” in 1926). Another 1904 series I don’t know anything about is “Bubblespikers”, quoted in http://www.krazy.com/herriman.htm. May it be one of the elusive “Weekdays”? 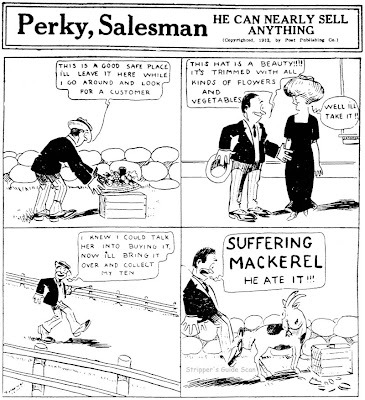 Here are some conjectures about WHERE could Herriman have published pre – 1907 weekday strips. Before that date GH worked for the “New York World”, for the McClure Syndicate (which, for unknown reasons, continued many series begun in the NYW), for the “Philadelphia North American”, where he drew many one shots and some short lived series such as “Tattered Tim”; for the above mentioned “NY Daily News”, and for World Color Printing. To my knowledge, neither McClure Sections nor the North American published weekday strips at the time; the NYW ** did **publish them (Allan has recently indicized it, and this may be a hint), and World Color Printing tried some syndication experiment selling “packets” of strips such as “Annie McGee”. In 1904 – 1905 Herriman authored a series of sport cartoons for Hearst’s “NY Evening Journal”: this is another place where he could have created short lived series, maybe the mystery “Us Husband” and “Bubblespikers”, if they do exist. Then he went to the “Los Angeles Times” (see posting of July 3 2007; no weeday strips there), and after a year or so he begun working again for Hearst creating political cartoons (the ones that Allan graciously offers us weekly in “Herriman Saturdays”) for the “Los Angeles Examiner”, the same newspaper that published “Proones” in 1907. Maybe Allan discovered something else in that newspaper. Or I am completely wrong, and Herriman created his strips for another newspaper that only Allan knows. Hope that the contest ends soon, so I’ll be able to sleep again. I have no knowledge of "Bubblespikers", so can't help there. In addition I am not aware of Herriman having done any series for the Philly North American, just a few one-shots in 1901-02. I have "Tattered Tim" as a one-shot on 3/2/02. What did I miss? 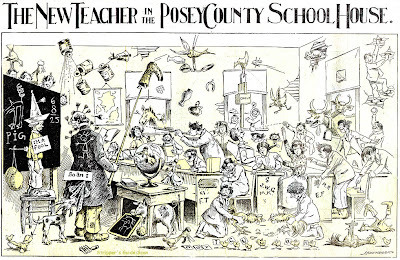 Here's a real early item, Posey County by Frank Ladendorf. 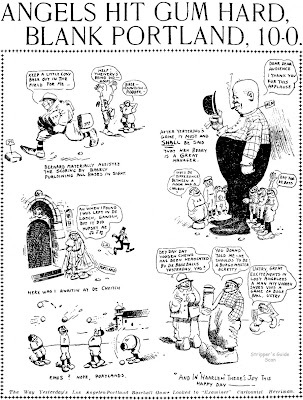 Ladendorf produced this series of Sunday panels for the New York World from August 1 1897 to May 15 1898. The Outcault influence is pretty obvious here, these action-filled panels closely resembling the great Hogan's Alley full pagers. Ladendorf was a fixture of the World's Sunday section from its inception to about 1903. He then switched over to the McClure Syndicate for a short stint, then eventually reappeared at the World for one last very quick appearance in 1908. I've already spent way more than my allotted time doing blog-related stuff this morning, commiserating with Cole Johnson over the ins and outs of the Philadelphia Inquirer. If you have an interest just search the blog for Philadelphia Inquirer and you'll find a number of posts with long comment threads attached. Hello, Allan--This strip is about as contrived a gag as possible. How the devil can you sell a lady a hat by just describing it? Also, what possible reason could there be to leave the hat on an old box somewhere? That's pretty bad. **MY 2 CENTS**---It doesn't look like Wellman to me, he was a great deal more professional than this character.------Perky, Johnson. No argument from me about it being pretty bad, but take another look at those faces -- those are Wellman faces. And the Freeman - Wellman names are awful similar. Might well have just been someone using Wellman references for swipes, but why would you swipe from someone appearing in the paper? Wish I knew more about Wellman's comings and goings, but I don't know if he was on staff at the Post or being distributed to them thru Associated. Usually I'd send this sort of thing on to toddlin' Tom Heintjes over at Hogan's Alley, but I know the latest issue is on the presses right now, and that means the next issue is at least a year or so away. So here's a sighting that is pretty well guaranteed to be coincidental since the two appeared mere days apart ... or does it mean both creators swiped from the same source! This is a two-parter -- tune in next week for the conclusion!